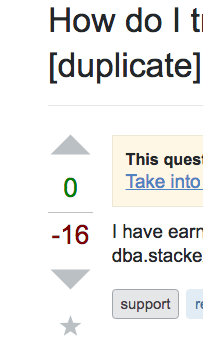 I am new to Stack Exchange and I think it's very impressive. One thing bothers me is that because it is so far down the line, I don't think beginners stand a chance of growing. As time goes on, more and more questions are being answered and therefore if someone asks something with a really basic answer you can just comment. However, beginners can't comment until they have a reputation of 50. The only way they can build up is by answering questions. But if they answer a basic question long winded, they will be voted down because not so much effort was needed or because its already a duplicate and will lose the bit of reputation they have earned. Can you tell me the future for beginners? I've been a member on EL&U since 2013 and I cannot tell you the number of times I've seen newcomers "complain" about the same issues: rep, privileges, comments etc. And you know what? They nearly all abandon EL&U after posting their question on EL&U meta. I suggest that you at least try to stick around for three months. There are ways of earning rep that does not include posting answers, i.e. suggested edits. Easy rep to earn, unless you're not sure of your English skills in which case be very careful about improving grammar and/or spelling. Nevertheless, you can always suggest adding a relevant link, improve the formatting of any post (questions or answers), fix punctuation, and better still, add more relevant tags. In reply to Rene's comment, I want to add that users on EL&U meta are far more forgiving than users on Meta SE. they will downvote questions that are off-topic or lack basic research but they will not pound a newcomer senseless because they have asked a question that has been asked a dozen or fifty times more, unlike here. All three questions were posted on MSE today (7 February). If you post an answer, and it gets downvoted, you can optionally delete your answer. After doing so, the rep you lost because of those downvotes will be returned. 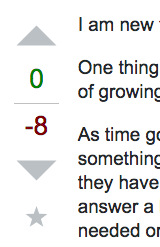 This makes sense if you "only" have downvotes for an answer, but if you have (eg) 2 upvotes and 1 downvote, your voting balance is "+1", and your total rep earned via such answer is 2*(+10) - 1*(-2) = 18. Even better: if you have (eg) 1 upvote and 4 downvotes, your total rep earned via such answer is 1*(+10) - 4*(-2) = 2, which is still positive (despite the negative voting balance). So by posting answers it is really tough to loose reputation points (and most often, if you have at least 1 upvote, your earn reputation). Downvoting questions is cheap (the downvoter doesn't loose any "rep"), as compared to downvoting answers (where the downvoter also looses "rep", i.e. -1, except for wiki answers). I'm assuming that, because of that, there are many more downvoted questions, as compared to downvoted answers. 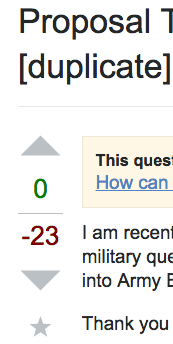 In other words: answers seem to have a lower probability of getting downvoted. Not the answer you're looking for? Browse other questions tagged discussion reputation new-users . How does a lurker gain reputation to receive privilege for commenting? What is the best way to increase my reputation and privileges?